This is a huge pet peeve of mine that I simply do not understand. Schools are still using writing as punishment. It’s wrong, wrong, wrong and the stupidity in such “punishment” really makes me angry. Maybe it’s one of those things that is done because it’s, “always been done,” and some never think twice about the ramifications and the message that is sent. If that’s the case, then it’s time to wake some people up. The basis of this punishment is an assumption that nobody actually likes to write. Can you imagine? As punishment, you will have to learn about somebody and put your reflections – on paper! In other words, research and (God forbid) writing is such an awful activity, that if you do something wrong – you are stuck with pen and paper, or in front of a computer screen to do something more than play games. You will have to…..to…..to….. write! How stupid can we be? How have we let this go on as long as it has? Do you need a Masters in Education to see how crazy this is? Well….forget that last sentence….many of them are the very people who perpetuate this atrocity. You might very well need to step away from the education establishment to see the absurdity in using writing as punishment. What can we do? If you agree, and you find your schools are using writing as punishment – complain. Loudly. In person – and in, uh, writing. If you have children and they are “threatened” with a writing assignment as discipline, it’s time to call the teacher and make an appointment. Many teachers when presented with the common-sense of NOT using this method will hit their forehead and say, “What was I thinking?,” others though will fight to the bitter end because that’s what they were taught. If they claim it is school policy – time to make the appointment with the principal. 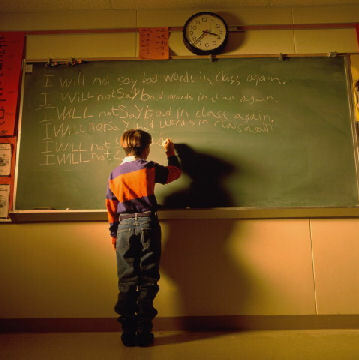 If the principal claims it is district policy – time to write that speech for the school board. Writing as punishment? What a horrible message to send our children. Let’s all – all of us who love pens, pencils, paper, books and writing – do our part to help change this upside-down kind of thinking about writing. No more writing as punishment. Period.